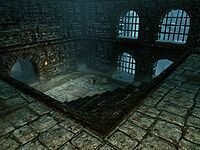 The Midden is a medium-sized dungeon underneath the College of Winterhold containing the Atronach Forge and home to Augur of Dunlain, a former mage of the college. There are three entrances; a trapdoor in the northern corner of the courtyard, another trapdoor at the base of the stairwell in the Hall of Countenance, or through an easy-to-miss cave in the northern face of the rocky outcropping that the College rests upon, the only way to access it without joining the College. The dungeon contains two sections, The Midden and The Midden Dark. Entering the Midden from the courtyard leads into an icy corridor heading northeast. The corridors and rooms beyond are littered with the bones of humans and animals, as well as various containers and plenty of other detritus and clutter. Carefully searching through this yields many items that can be used at the Atronach Forge, including salt piles, torchbug thoraxes, rubies, empty wine bottles, brooms and skulls. On the left beside a pile of firewood is a pair of iron boots. Opposite these against the other wall is a bucket containing a leather strip. Ahead, the corridor opens into a room with a walkway around two sides of it and a level below with a flight of stairs leading down. The hanging skeleton with the deer head has two rubies for eyes, which can be retrieved using Telekinesis or by disturbing the skeleton and causing it to fall (which risks the rubies falling to random locations). Above on a shelf at the ceiling is a basket containing four refined moonstone. On your right are barred openings looking into another room with water falling ahead. On the left the walkway continues past another corridor heading northwest. In the northern corner on a wooden block is a cast iron pot containing a potion of cure disease and in front of that is a patch of white cap fungus. The corridor passes two small alcoves opposite each other. The one on the right contains two more patches of white caps and has a strange idol fashioned from bones and deer antlers, behind which on the left is a piece of canis root. The one on the left has a crate with a bulb of garlic on top, while further along on the left is another patch of white cap. The corridor ends at a wooden door leading to the Hall of Countenance. Descending the stairs, the floor below is partially covered in old rugs. There is a pickaxe at the bottom of the stairs and two rubies on the floor behind a crate near the eastern corner. There is another barred opening and one that is unbarred. In the room beyond you can hear an undead creature moving around. A corridor heads northeast from here. Ahead is a fork in the passageway with a patch of bleeding crown in the middle, an oil slick leaking from a drain on the right and a skeleton on the floor. By its outstretched hand is a random enchanted iron dagger. To the right is a short passage leading to an open cell with a bed roll inside, with blood splattered all over the floor and walls, and a chair sitting outside the cell. To the left the passage ends at the top of a flight of stairs, with an ice wraith lurking at the bottom. The room beyond has a high vaulted ceiling with many arches supporting it. The passage continues to the northeast, and after a short distance turns to the southeast next to a magical light source that lights up as you approach. Ahead the passage descends another flight of stairs and then opens up into a circular chamber in front of the Atronach Forge, with is a passage heading southwest. To the left of the forge is a wardrobe with a small square wooden table in front. On the table is the Atronach Forge Manual, two bowls of fire salts and a ruby, and beside it a broom. The forge itself is a raised circular stone with the Oblivion daedric symbol carved in the center, a pedestal, an offering box and a handle on the nearside. The passage to the southwest curves around to the south and ends at a close gate with a chamber beyond with hanging moss growing down the wall. On top of crates against the east wall is a bucket containing a deathbell and torchbug thorax, while opposite the passage you enter from, against the south wall is a slightly raised section with a patch of white cap and a patch of Namira's Rot growing on top. There is a ledge on the wall above holding a salt pile and red mountain flower, and above this is a deer skull fixed to the wall. There is a leather strip and orange dartwing on the floor against the north wall, while the passage heads west into the room seen through the barred openings. There is a cart with more empty wine bottles in and around it and to the left a flight of stairs leading up to a walkway that ends under two arches where a restless draugr archer stands. There is a wooden door to the west at the bottom level. Behind this is an L-shaped passage that ends with another door leading to The Midden Dark. Beyond the door a passage heads east for a few paces and then turns north. On the corner is a skeletal design with some hanging moss growing to the right. To the north is an ice chamber with a bridge crossing a chamber below. It is guarded by an ice wraith. Below you on a rock to the left is an unlocked wooden chest. Across the bridge an ice tunnel enters another chamber with stairs up on the right and a passage heading northwest. This leads to an flight of stairs descending to a chamber with a wooden door that is locked and says it requires a key (there is no actual key for the door, which is scripted to open in the course of quests). Beyond is the Augur of Dunlain, whom you can gain access to during Good Intentions and again when you come to complete the Restoration Ritual Spell. Climbing the stairs on the right leads to a passage heading north, before descending another flight of stairs. At the bottom there is an alchemy lab in front of you with a salt pile and a copy of the Alchemy skill book De Rerum Dirennis. To the left is a patch of white cap and to the right stairs down into a room containing two skeletons standing on a lower level filled with human bones. To the southeast is a wooden door. Behind the door is a circular ritual chamber with a large black metal gauntlet on a pedestal, central to the quest Forgotten names. The symbol of Oblivion is emblazoned on the palm of the gauntlet. A long wooden table opposite has The Midden Incident Report and the Investigator's Key on top. Following the clues in the report, the player can find the needed rings in the Arcanaeum, in a master-locked chest. The lock can be picked, or simply opened with the key. Returning the rings to the gauntlet will activate it, and the gauntlet will clench into a fist. Shortly afterwards the dremora Velehk Sain will be summoned. An alcove to the right contains a kettle containing two pieces of creep cluster, a bowl of fire salts and a sample of ice wraith teeth. Beside this is a goat hide and on a crate behind is an iron war axe, a salt pile and a canis root. Opposite the alcove against the wall is a bucket containing a silver sapphire necklace. There are several hanging moss growing from the walls and a ring of skulls high up on ledges around the room. To the east a corridor leads to the top of more stairs with a dead goat, a leg of goat, a bloodied woodcutter's axe, a salt pile, a sheaf of wheat, a bulb of garlic and a loose septim all on a cart wheel. At the bottom of the stairs is another passage that is eventually blocked by thick cobwebs you will have to burn or chop your way through. 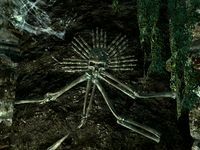 Ahead in another heavily vaulted section are two leveled frostbite spiders. Around the area you can find several more white cap fungus growths, a skeleton that can be looted, an iron helmet, a banded iron shield, an iron sword and a lute. The passage exits the area heading west, passing into the chamber beneath the bridge and then outside to the shore beneath the college. Once through the exit, the player can reenter the dungeon or jump down a small cliff to a cave below. The cave exits near the shoreline underneath the college. It is possible to enter the Midden Dark through this cave with a combination of sprinting, jumping and persistence. This is useful for characters wishing to access this area and the Atronach Forge without having to enroll with the College. The three undead required for the quest J'zargo's Experiment can conveniently be found here (one in the Midden, two in the Midden Dark), provided the quest has been obtained before clearing the dungeon. During the Conjuration Ritual Spell quest, Phinis Gestor will give you the spell Summon Unbound Dremora and tell you to go get a Sigil Stone. This is the missing spherical object needed for the most powerful objects the forge can produce. When in the Midden, the door to Hall of Countenance is a wooden door through a wall. But when in the Hall of Countenance, the door to the Midden is a trap door under the stairs. The Midden also appears in Legends, in the Return to Clockwork City storyline. This page was last modified on 22 April 2019, at 23:25.